Rear Drag Race Brake Kit 8.8 Ford Housing Ends With Stock C-Clip Axles, Non-ABS, For Use with 1/2" Wheel Studs. Rear Drag Race Brake Kit 8.8 Ford Housing Ends With Aluminum Block Style C-Clip Eliminators For Use with 1/2" Wheel Studs. Rear Drag Race Brake Kit For Big Bearing Ford "Old Style" Housing Ends For Use with 1/2" Wheel Studs. Rear Drag Race Brake Kit For Dana, Mopar 8 3/4 Housing Ends For Use with 1/2" Wheel Studs. Rear Drag Race Brake Kit For Lamb, Symmetrical Housing Ends For Use with 1/2" Wheel Studs. Rear Drag Race Brake Kit For Large GM Housing Ends For Use with 1/2" Wheel Studs. Rear Drag Race Brake Kit For New Style Ford "Torino" Housing Ends For Use with 1/2" Wheel Studs. Rear Drag Race Brake Kit For Olds/ Pontiac Housing Ends For Use with 1/2" Wheel Studs. Rear Drag Race Brake Kit For Small Bearing Ford Housing Ends For Use with 1/2" Wheel Studs. 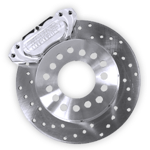 Rear Drag Race Brake Kit For 10/12 Bolt "Small GM" Housing Ends For Use with 1/2" Wheel Studs.